Even though all of us follow the English Calendar for all our activities, the Indian States have their own calendars and months that are different from the English Calendar. Aadi Maasam or Month marks the beginning of the festival season. This year it began on July 17. For a non conformist, keeping track of all the poojas is impossible. However for devotees are observe all the poojas, it becomes a regular activity that they follow without fail. Amma follows each and every pooja and has a specific custom as well. Having settled in Tamil Nadu for over 4 decades, she has got into the practice of celebrating and observing all the Tamilian festivals as well. This year out of the many Aadi special poojas, I happen to see what she was making for Aadi Krithigai. Aadi Krithigai is an important festival celebrated in the Tamil month of Adi or Aadi. The festival is dedicated to Lord Muruga or Subrahamaniya. According to Hindu scriptures, Lord Muruga was born as six different babies. He was looked after by the six Krittika stars. When Lord Muruga attained boyhood, he was combined as a single baby with six heads by Goddess Parvati. The Krithigai star or Nakshatram is considered highly auspicious to worship Muruga. And Aadi Krithigai is more important because Aadi is the first month in the Dakshinayana punyakalam – when the sun god changes his direction from north to south. Grand arrangements are made on this day to mark this occasion and many visits the temple to do special poojas as well. At home, an elaborate feast is prepared and offered to the Lord. Amma makes Kalanda Sadam (Mixed Rice Dishes) on this day along with the regular Vada, Payasam. Though this festival is celebrated every year, I never had an opportunity to capture it. This year, since it fell on a Saturday, I managed to capture the prasadams that were cooked for the naivedyam. Of the above menu, I requested Amma to make new versions so that I could blog about it as well. You know that request always gets Amma into action and she suggests all the left out recipes of hers. 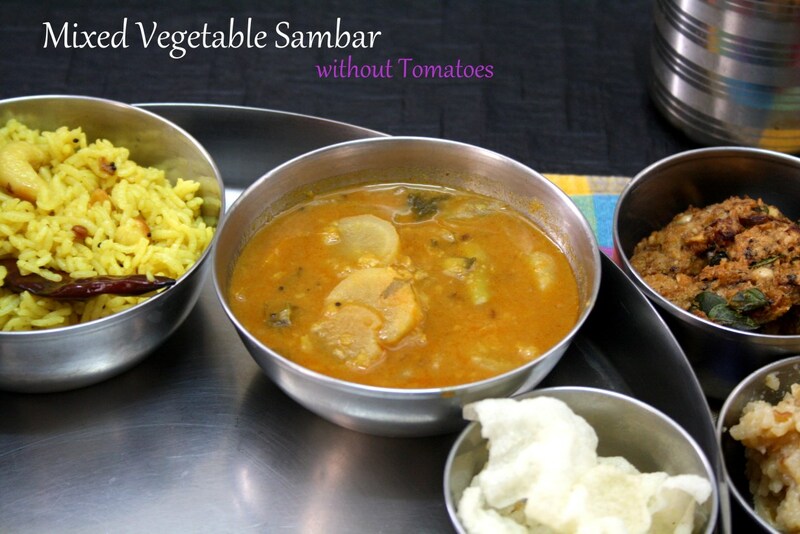 This year we made a different version of Pulihodaria, Sakarai Pongal, Vada, and Sambar. Payasam Varieties from Spice your Life! Pongal Varieties from Spice your Life! Mixed Rice Varieties from Spice your Life! A good read , I had absolutely no knowledge of the Tamil Festivals. Hats off to Amma for trying new dishes ???? Very delicious spread and glad to know that you have managed to click this time. Wow, my kind of foods, i can happily have these delicious dishes without any fuss, prefect dish for Aadi festival. Nice read about Adi Krithigai since I didn't follow Tamil calendar I don't know much about this festival. Thali looks so delicious.. Such a nice spread of food for aadi kirthigai festival..Well made ..
Festivals are just for eating in my house. The girls make fun of me but come to ask what I am making. Love the info here. I have absolutely no knowledge about TN festivals. Thats an very interesting info you have shared , I love aadi masam koozhu with murungakeerai poriyal a lot .. all those variety rice and vada pongal payasam is seriously making hungry .. such an tempting platter valli .. I have seen people around here celebrate this aadi festival with special dishes but I have never made one.Nice write up and that's a delicious spread!